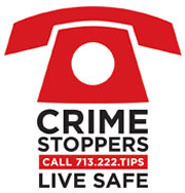 On Tuesday, July 10, 2018 at around 7:15 am, the complainant parked her green Nissan SUV at her daughter’s townhome, located at the 7100 block of Jetty Lane, in Houston, Texas. The complainant stated that an unknown black male approached her as she exited her vehicle while pointing a handgun at her face and demanded her car keys. The complainant complied with the suspect and gave him her keys and purse, at which time the suspect got into her vehicle and fled the scene. Suspect #1: Black male, 25 to 27 years old, 6’03, 220 pounds, black shirt, black pants and black shoes with white shirt around his face. Suspect #2: Black male, 25 to 30 years old, 5’10, 180 to 190 pounds, black hair, brown eyes and black shirt.